Nitecore EA4 (Pioneer) Compact Searchlight, designed for senior outdoor enthusiasts, officially launches on 23rd November, 2012. The Nitecore EA4 is the world’s smallest, lightest and brightest 4 x AA searchlight, offering massive output and throw from a compact palm-sized body. Nitecore’s novel proprietary 'Unique Integrated Technology' allows the merging of the flashlight head and body into one seamless component, aptly named the ‘Unibody’ by Nitecore's design team. This unique approach makes the Nitecore EA4 one of the most compact, lightweight and high- intensity illumination tools ever made. The EA4 also features ‘Precision Digital Optics Technology', whereby computer simulation and precise point-to-point curved reflecting methods ensure optimal reflector performance. This translates to an even, full-coverage beam capable of illuminating targets at up to 283 meters (ANSI / NEMA FL1). In other terms, the EA4's peak beam intensity is rated at 20,000cd, which is at least DOUBLE that of competing products. Furthermore, the EA4 is powered by four easily-sourced AA batteries and features Five brightness levels plus Strobe / SOS modes and a ‘Location Beacon’ function. With its versatile feature set, ultra-high-intensity beam and extremely compact size, the Nitecore Pioneer EA4 Searchlight is the ultimate lighting tool for both outdoor enthusiasts and working professionals. 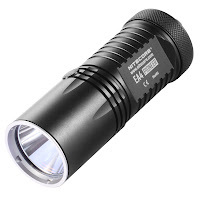 You can buy the NITECORE EA4 in our online store just now!